Discovering a new bakery, especially one that uses herbs, is a special treat. Botanical Bakery offers a variety of gourmet tea cookies. They use only organic ingredients. The tea cookies are small, crisp and buttery. I ordered Lavender Tea Cookies on Monday and they arrived on my doorstep in Seattle on Tuesday afternoon. Botanical Bakery, located in Napa Valley, offers six flavors; Lavender, Cardamom, Cinnamon Basil, Lemon Thyme, Ginger Lemongrass, and Fennel Pollen. These gourmet tea cookies only rely on three basic ingredients: flour, butter and sugar. They are handmade and are flavored with aromatic culinary herbs and spices. Serve these small tea cookies with tea, wine and cheese. You can order the tea cookies online at http://www.botanicalbakery.com/products.aspx. Stay tuned for my own recipe for Lavender-scented tea cookies. Thank you Botanical Bakery for motivating me to experiment with these three basics – flour, butter and sugar – flavored with aromatic herbs! I used to believe marshmallows were for kids, camping and jello salads. This summer when I made marshmallows at home, I rediscovered these sweet treats and learned about six of their sensational secrets. 1. 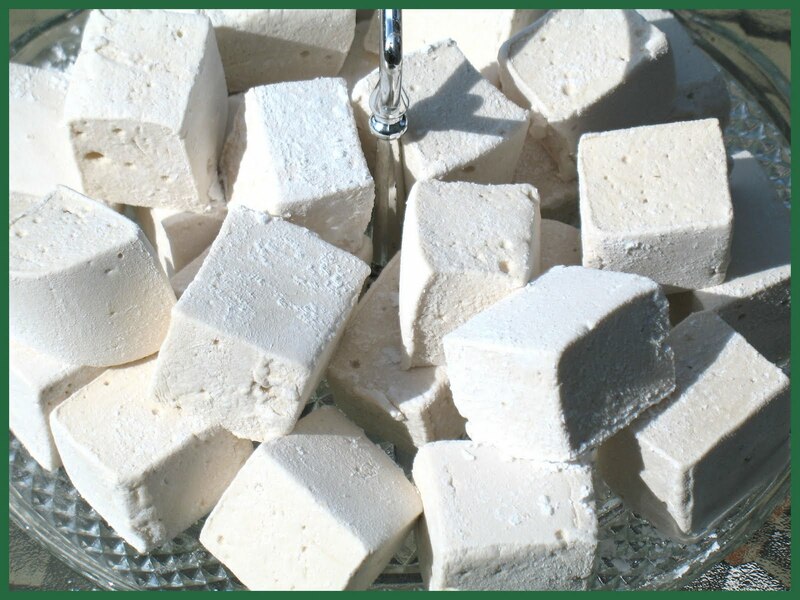 Marshmallows get their name from an herb called the Marsh Mallow. The root of this plant contains a jelly-like substance used by ancient Egyptians for both medicine and candy. 2. Marshmallows are easy to make at home. They rely on corn syrup and sugar for sweetness, a little bit of gelatin to give them their sponge-like texture, water, and flavoring. 3. All these ingredients are whipped together for about 10 minutes. The whipping adds air to the confection to yield a light pillow-like quality. 4. August 10th is national S’mores Day. This campfire delicacy, consisting of a gooey marshmallow sandwiched between two graham crackers along with a square of chocolate candy, was introduced by the Girl Scouts in their 1927 Handbook. 5. Marshmallows can be flavored with vanilla, chocolate, fruit, peppermint or even espresso. 6. You can make your marshmallows in whatever color, size of shape you want. Try flavoring them with a tiny amount of lavender, and adding a drop of lavender food coloring. Serve in s’mores and you will earn a reputation as a gourmet cook! And wait, there’s more: Marshmallows can be frozen. When you are ready to use them, just thaw. Use them in s’mores, as a garnish for hot chocolate or add them on skewers with fresh fruit and pieces of pound cake. How do like to serve marshmallows? What flavor do you like best? And wait, there’s more: Marshmallows can be frozen. When you are ready to use them, just thaw. Use them in s’mores, a garnish for hot chocolate or add them on skewers with fresh fruit and pieces of pound cake. “I thought we would stay home for dinner tonight.” Patty said. “I am going to make a light Southwestern-style chicken soup and a salad.” My sister Patty and her husband, Stan, had picked me up at the Airport in Grand Rapids and we were driving to their home. The early evening sun was still hot and the air felt sticky. I had come to Grand Rapids for Patty’s book launch party at a local bookstore. She Walks into the Sea, Patty’s third book of poetry, had been published by Michigan State University Press in July. I was thrilled to be here for this special occasion. Sipping cold Sauvignon Blanc, I watched Patty standing near her stove cooking the soup. Occasionally, she would stop and check the recipe in her cookbook, Canyon Ranch: Nourish: Indulgently Healthy Cuisine. The soup recipe called for yuca. 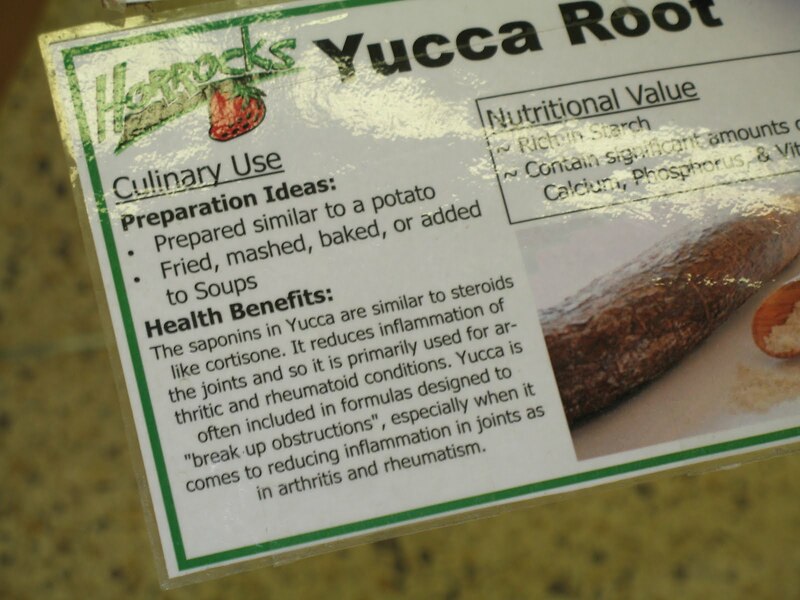 If yuca was not available, the author suggested potatoes as a substitute.“What’s yuca?” I asked. “I have no idea,” Patty replied. “Tomorrow when we visit the Farmers Market, let’s see if we can find out.” Patty diced potatoes and added them to the soup. We went on like this, putting the question to farmers selected randomly. Finally we got a clue from a friendly, talkative man standing behind a counter filled with potatoes. Wearing a sweatshirt with GVSU (for Grand Valley State University) on the front and smiling with a gap-toothed grin, he told us yuca was the root of the plant. He had never eaten it, and did not grow it, however he suggested we talk with another farmer from Turtle Island Farms. “If anyone knows, this guy will. Look for him a couple stalls down on the right.” He pointed toward a booth. Patty and I wondered about his credibility; how come his story had changed? After buying blueberries, two types of cherry tomatoes and two flower bouquets, we left the market. We couldn’t resist. Off we went to Horrocks Market. As we drove into the store parking lot, we commented on the flower baskets filled with bright green hops and deep purple petunias. Patty and I walked past Halloween merchandise, heading directly for the fresh produce section. Not sure that we would recognize yuca even if we met it face-to-face, we called out to a young man wearing an apron with the Horrocks logo. “Can you tell us where to find yuca?” I asked. “I notice you have an accent, what country are you from?” I asked. With a warm smile, he replied, “Mexico”. We selected one yuca, headed for the check out and were on our way. When we returned to Patty’s house, I googled yuca and discovered it is also called cassava and manioc. The starchy substance when extracted from the cassava root and then dried is called cassava flour to tapioca. Seattle’s summer left town for Labor Day weekend. On Monday, I went for a five-mile run. Panting for air, I struggled up a steep hill. This stunning shrub stopped me with its beauty. Honey bees could not resist these big blossoms. Maybe the summer weather had taken a holiday,however the bees were on duty and the bush was doing its job. Okay, maybe I was looking for an excuse to take a break from climbing up this slope. I shot photos for ten minutes. What is the name of this plant? The leaves reminded me of a hydrangea, but the flowers looked nothing like hydrangea blossoms. And what about the berries, so dark and shiny? I had to discover the plant’s identity. Today, when I looked at my photos, I once again marveled the plant’s beauty. I emailed the Elizabeth C. Miller Library asking for help. I attached a photo. 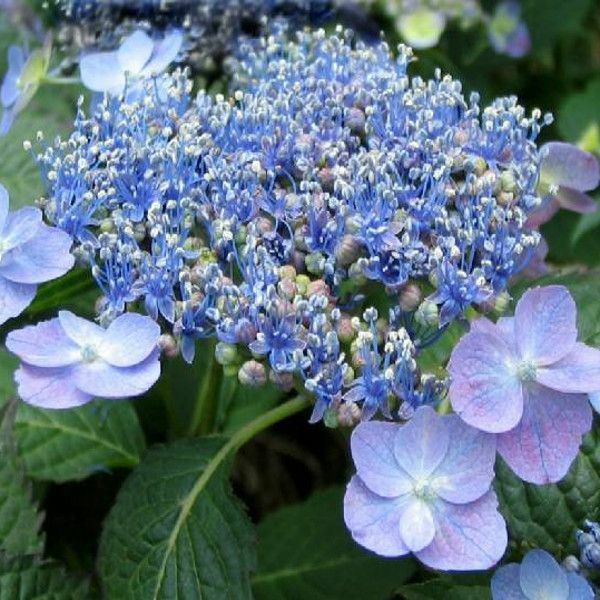 Needs sun for best bract and fruit color; prefers rich, moist loam; tolerates wind, drought, and air pollution…A handsome woodland shrub best in natural setting or shrub border. Needs sun for best flower and fruit color. May be pruned in spring. Partial dieback in winter not unusual; shrub rejuvenates the following growing season, often growing back successfully from roots…. 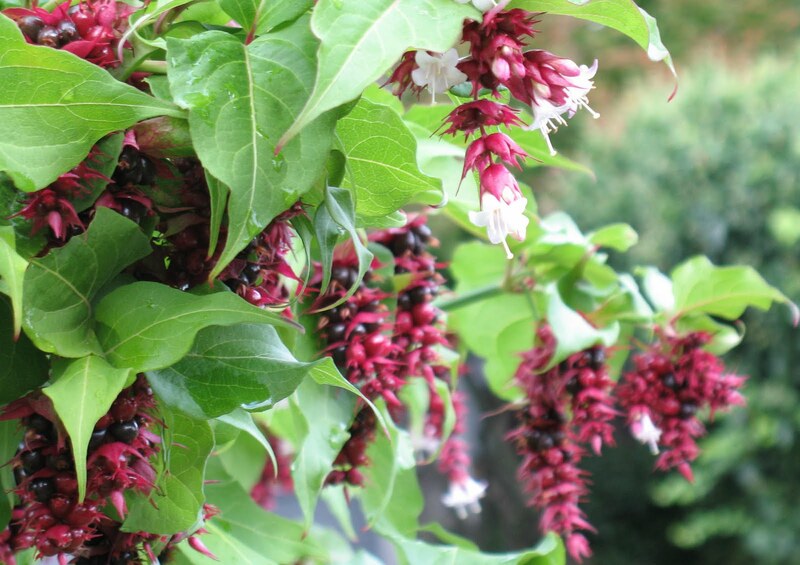 The website of Rainyside Gardeners (a Northwest site) has a useful page on Leycesteria formosa. Thank you to Carrie Bowman at the Miller Library for the information.We are so fortunate to have this horticultural library in our community. I have been looking for some plants to brighten my garden. I think I just found what I was looking for!